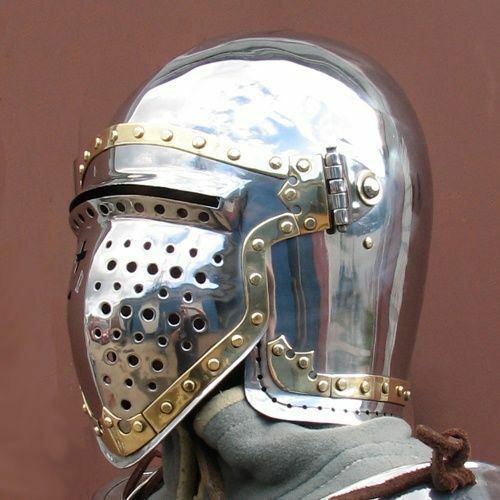 Bascinet is one of the most popular and widespread medieval knight helmet in the XIV century. 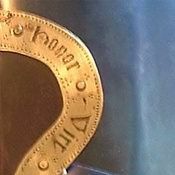 Such type was developed from the steel round cap, which was worn under the tophelm. This model was typical for 1350-1140 years. 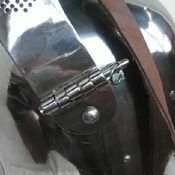 The striking feature of this type of Bascinet is double-point fix on the both side of helmet. Mobile visor with single ocular is allowing great visibility and safety. Holes in visor provides with good ventilation. 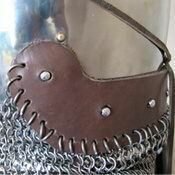 Quite often, bascinets are worn together with chainmail and padded aventail.  You may order it separately in our store. 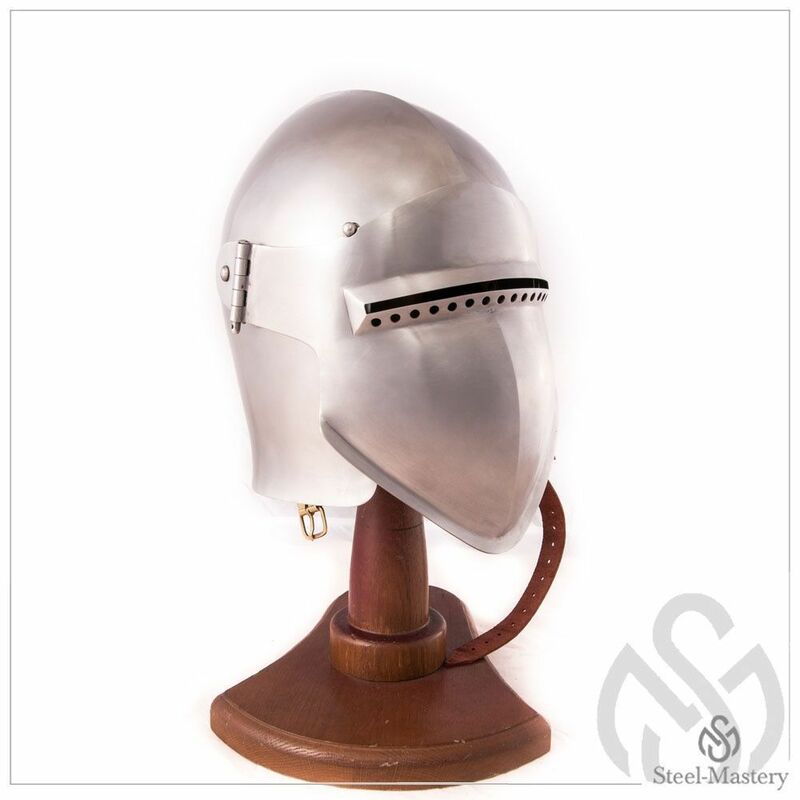 You may also like these models of the XIV century bascinets: Bascinet with curved visor, Bascinet with klappvisor, Bascinet with side-hinged visor. To recreate the image of a medieval knight, you need to pay attention to the other elements of protection - brigandines, arm armours and leg armours. In section “Helmets” you can see all models that we offer for ordering. If you didn’t find any for your taste and wish, please send us photo and description of the required model and we will make it for you. 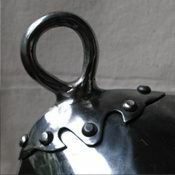 Conical spangenhelm was popular among Norman knight all over Europe in the XII century. This model is a type of medieval nasal helmet. 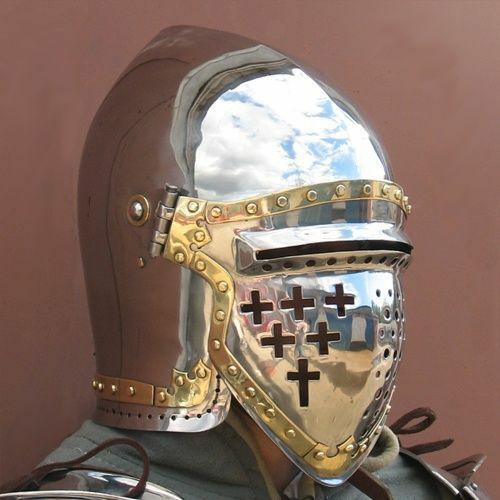 Frame of this battle helmet represents metal strips. Plates are riveted to this framework with steel or brass rivets. 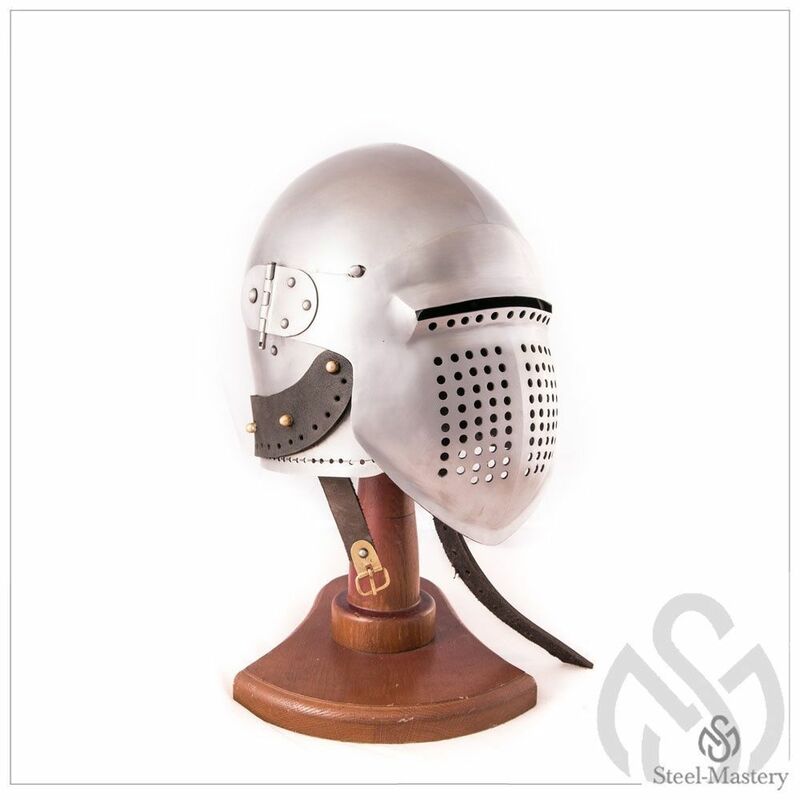 Nasal plate and bar grill visor provide with perfect protection of face. 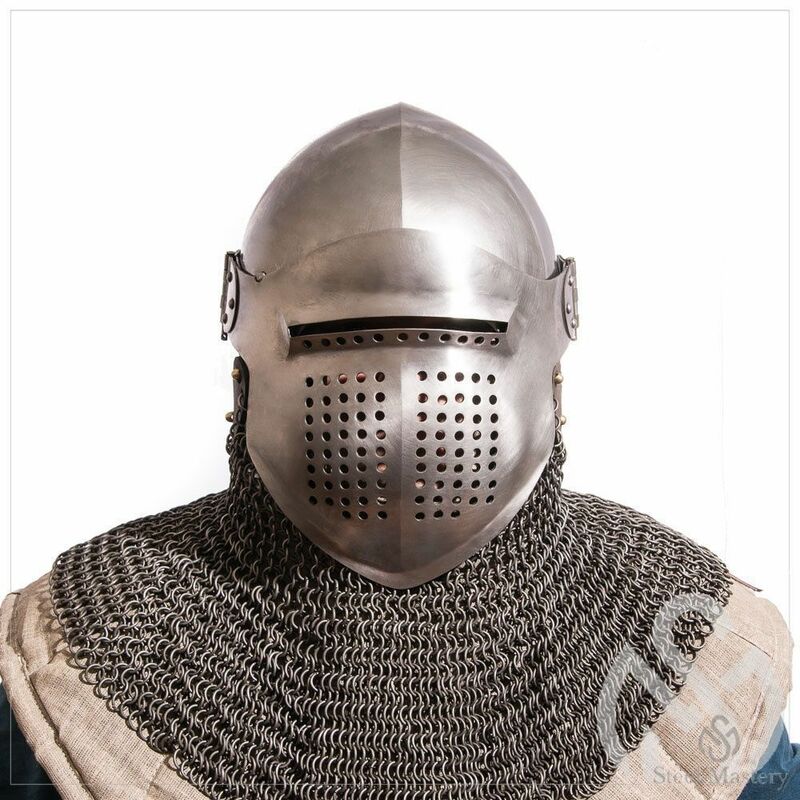 Also, there is a plate which guards back part of neck. 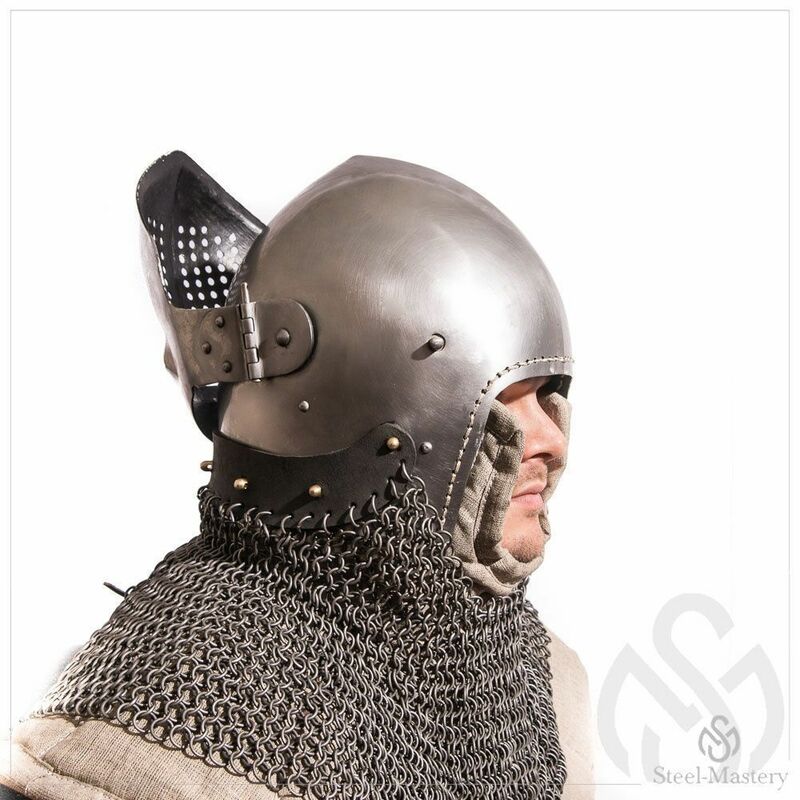 We recommend to complete this early medieval battle helm with mail aventail. 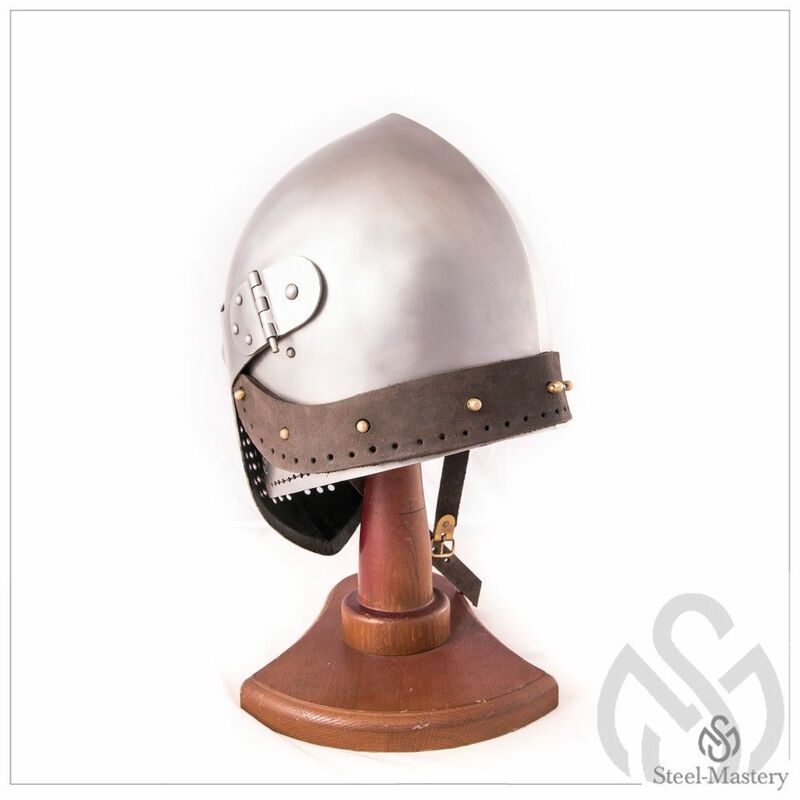 You can use this custom handcrafted head protection for: SCA HEMA Larp Stage performances Medieval festivals Reenactment events Main photo shows early medieval helmet with following options: Cold-rolled steel 1.5 mm; Satin polishing as finish treatment; Brown leather belts; Steel nickel-plated buckles; Steel rivets; No decoration; Sewn liner; Mail aventail Base price includes following options: Cold-rolled steel 1.5 mm; Satin polishing; Brown leather belts; Steel nickel-plated buckles; Steel rivets; No decorati..
Italian bascinet "Hounskull" of the 1460 year was widespread among European knights. There were no holes on the left side of extended visor, because this part of helmet often caught an attack of spear. Typical feature of Italian bascinets were almost straight back part of dome. Eye slits and holes provide with perfect vision and ventilation. 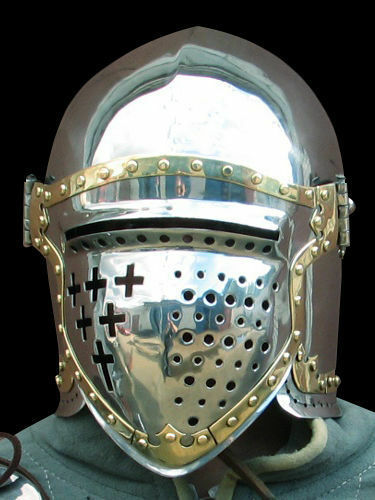 By you regard, we may make a cross on the left side of visor. 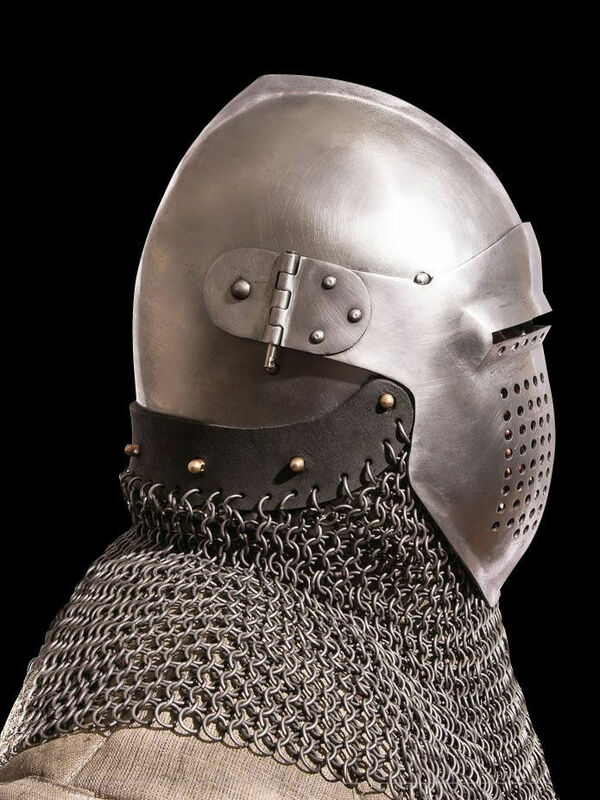 Italian bascinet from the Metropolitan museum of Arts, New York, USA This functional armor is fastened with underchin leather belt and buckle. 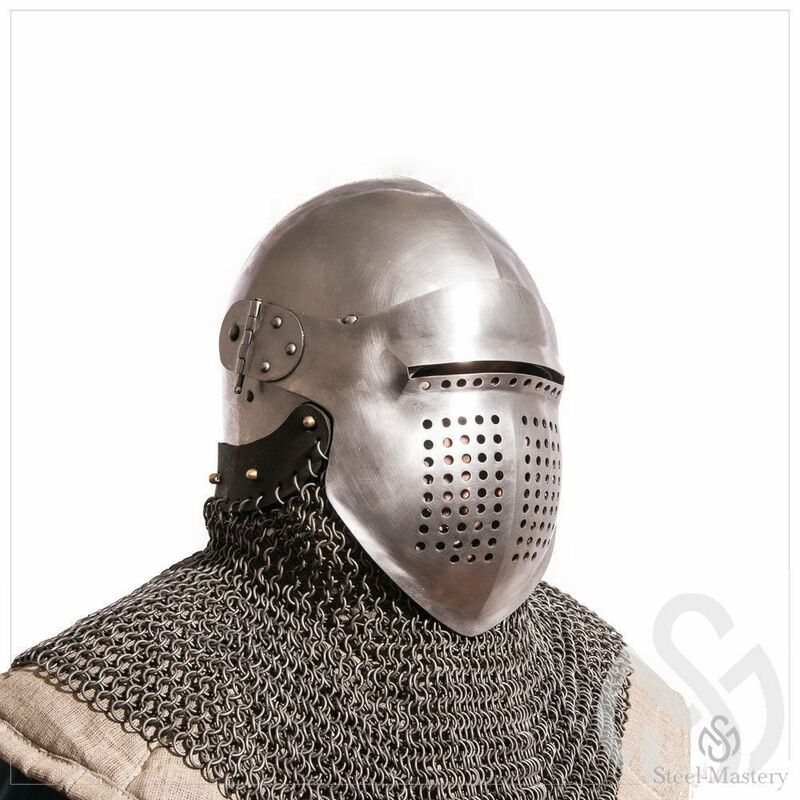 Medieval knights used mail and padded aventail for better protection of throat, neck and shoulders and we recommend to do the same. 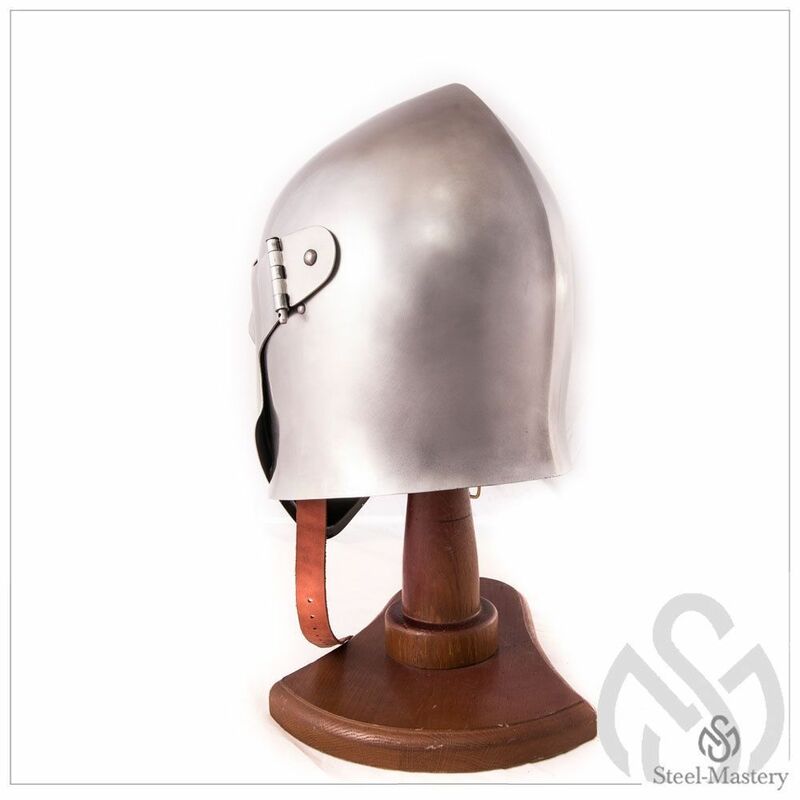 You can use this custom-made head protection for: SCA HEMA Larp Stage performances Medieval festivals Reenactment events Main photo shows steel battle helmet with following options: Cold-rolled steel 1.5 mm; Satin polishing as finish treatment; Steel rivets; Brown leather and steel vervelles for aventail; Visor back .. Similar model of bascinet with peak had been found in archaeological excavations and is dated by XIV century. 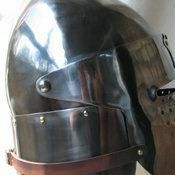 Though, only few miniature paintings confirm the usage of such helmet by medieval warriors. 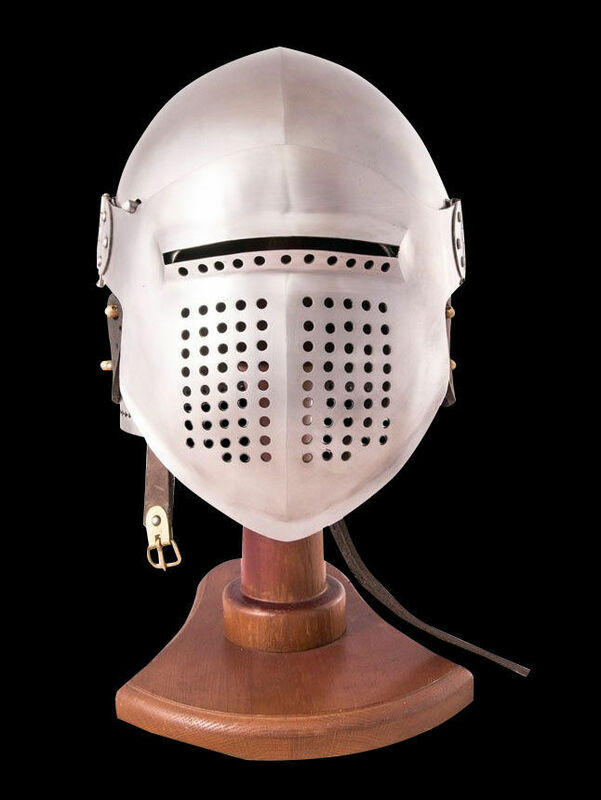 Despite of less popularity, this type of helmet combines the most important properties, required for safety battle: good visibility; perfect ventilation; reliable protection Peak amortizes the striking force in case of strict stroke. 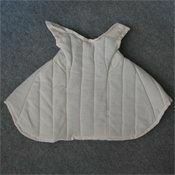 Mail aventail together with padded pelerine provide with complete face and neck protection. Bar grill visor has distance 2.1 cm between the rods that is completely compliant to SCA standards. 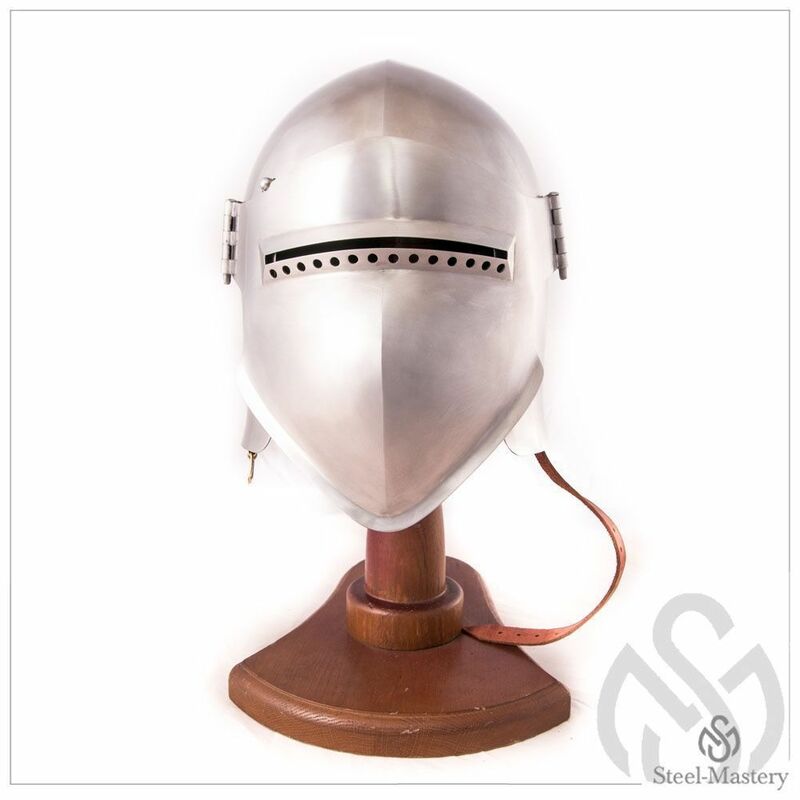 You can use this functional battle helmet for: SCA HEMA Larp Stage performances Medieval festivals Reenactment events Main photo shows metal head armor with grill visor with following options: Cold-rolled steel 1.5 mm; Satin polishing as finish treatment; Steel rivets; Steel vervelles for aventail; Steel buckles; Brown leather belts; Mail aventail; Padded..